Let me preface this recipe by saying I am not a hot dog person–it’s the last thing I would ever choose from a restaurant or fast food place. My husband, on the other hand, is a hot dog/hamburger lover. Whenever we are in Costco his eyes light up as we pass the giant, yellow box of Corn Dogs. I cringe thinking 1. why would we spend so much on corn dogs, and 2. Where would we fit a box that big! There are times when this one-liner works like a charm, and others when it comes back to bite me! 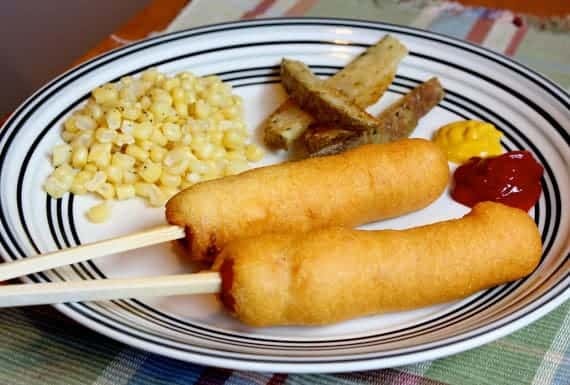 However, I caved and made them, and have since made homemade corndogs many times and they’ve become a favorite! He absolutely loves them and I was suprised how much I really like them too. They’re extremely cheap to make and they taste better and are better for you homemade. Heat oil for frying in a cast iron skillet, dutch oven, or deep fryer. 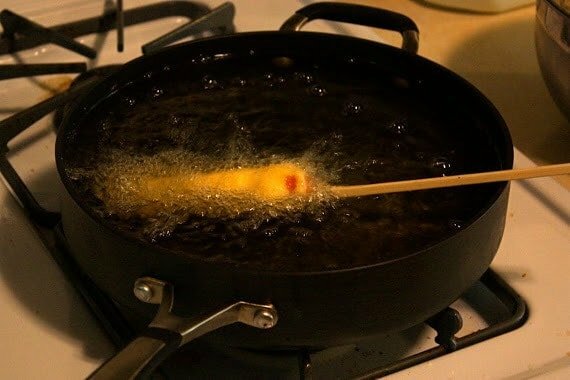 Heat to about 375F or test the temperature by putting a piece of bread or drop of batter in the oil. When the bread/batter float to the top and turn golden brown, you know the oil is hot enough. Whisk together the flour, corn meal, baking powder, salt, baking soda and cayenne. In a separate bowl whisk the egg and milk. Add the dry ingredients to the wet ingredients all at once, and mix just until combined (don’t over mix). Let the batter rest for 10 minutes. Meanwhile, spread the cornstarch on a plate. 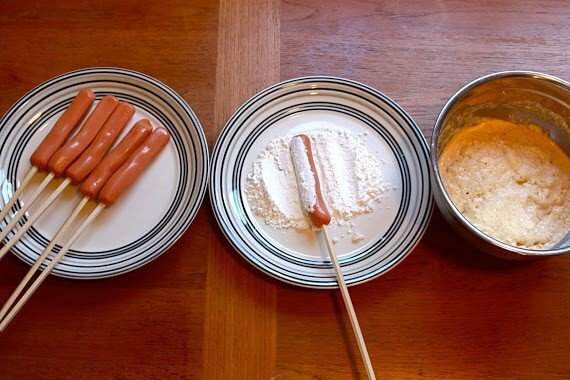 Place each hot dog on a skewer and roll in the cornstarch. Pat off any excess cornstarch. 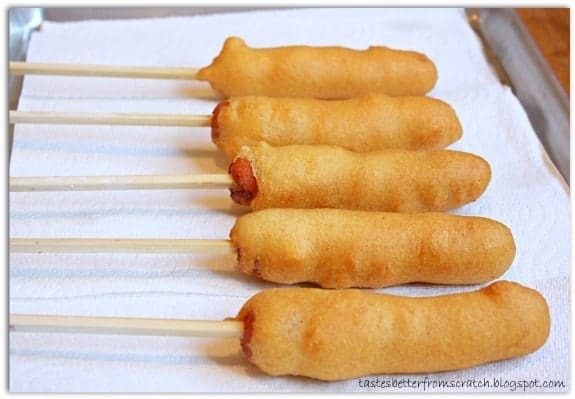 Then dip the hot dog in the batter and immediately place it in the hot oil. Cook until the coating is golden brown, 3-4 minutes. 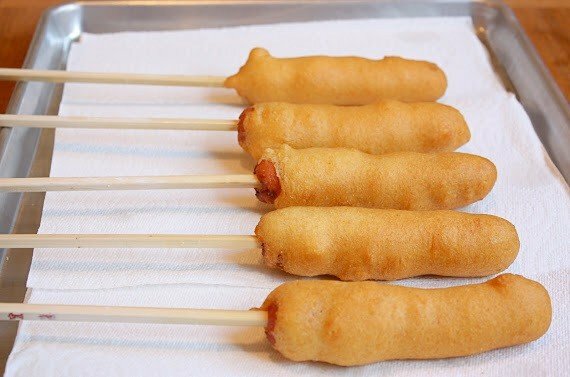 Place the corn dogs on paper towels for draining. Hi Gina! In, theory…yes. I’ve never tried it, so I can’t say for sure how it will affect the batter frying in the hot oil.